Foreign Policy: The Fine Art Of Lunacy As Strategy News of North Korea's latest nuclear stunt has launched debate about the mindset of country's leader, Kim Jong Il, once again. David Rothkopf of Foreign Policy argues that what the rest of the world sees as strange behavior from the ruler has actually been a winning strategy. David Rothkopf is a visiting scholar at the Carnegie Endowment for International Peace and President and CEO of Garten Rothkopf. Bill Clinton once noted that nuclear weapons were North Korea's only cash crop. It was a wry and on-target observation that underscores a critical point. There is clearly a method to the madness of Kim Jong Il and the regime he leads. After this week's revelations about North Korea's latest nuclear initiative followed by yesterday's exchange of fire between North Korean and ROK troops, it would be easy to suggest that the country is once again going through one of its periodic bouts of irrationality. And by any traditional calculus of behavior, it is hard to deny that a small, impoverished nation frittering away scarce resources on a giant military despite the fact that there is zero chance they could ever defeat their principal adversary seems nuts. But that would only be the case if the value of that military were measured in traditional, abstract terms. If this measurement is balanced in the context of the North Korean leadership's political needs, it makes more sense. Maintaining a confrontational stance with the South provides a rationale for an authoritarian state and a reason to have the forces in place to maintain that state. It also provides a useful distraction from the utter failure to create a healthy economy within the country. Furthermore, every time North Korea flexes its muscles, threatens its neighbor, or violates international law it gains stature unavailable to it via any other means. Think about it: North Korea has a GDP smaller than Costa Rica, roughly the half the size of that of say, the Sudan. Finally, every time the North does one of these things, the response of the rest of the world actually, brings about benefits. After the "official condemnations" die down and the sanctions are proved to be ineffective -- as they inevitably are when pitched against a country in which the will or discomfort of the people does not exactly drive the political system -- North Korea gets a reward of some sort, a deal, an aid package, energy supplies, food. Best of all, the rest of the world accepts its word on vital matters even though North Korea has never ever kept its promises. As they say in my part of Pyongyang, "such a deal." Is it any wonder that Kim Jong Il continues to turn to his nuclear program to be his main cash crop, to make "lunacy" his country's principal export? This is not to minimize the risk from the North. Actually, it underscores that it is likely to remain and fester for the foreseeable future. 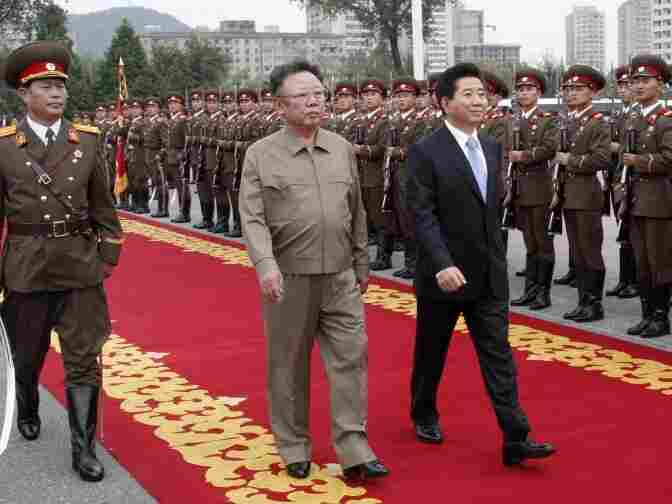 In fact, some observers see this week's events as an effort by Kim Jong Il to provide "victories" for his son and heir apparent, Kim Jong-Eun. The fact that the unveiling of the sophisticated "astonishingly modern" (see today's Financial Times story "Kim Jong Il Plays His Aces") uranium enrichment facilities are seen as yet both a coup for the North and a shocking intelligence failure for the United States and our allies already puts it in the win column. The fact that the exchange of gunfire today was met with communiques and deep restraint (thus far) suggests it too may end up in the plus column for the dear leader and his clique. These events may also ultimately be seen as wins for Kim on two other levels. First, the nuclear facility almost certainly required international collaboration. If it turns out that support came in part from, say, Pakistan, already suspected of helping the Koreans develop a nuclear ballistic missile capability, it would be deeply embarrassing and awkward for the United States. Next, the fact that the United States and South Korea are really hamstrung on this issue, almost entirely dependent on the Chinese to put real pressure on the Koreans, makes this issue yet another that underscores how the balance of power has shifted away from Washington -- even with almost 40,000 troops on the ground in South Korea and North Korea a top diplomatic priority for the administration. In short, call Kim strange, joke about his quirks and collection of VHS tapes. I can't help doing so sometimes. But we ought to stop suggesting he is irrational or unpredictable. What he is doing, it's completely in character, following a clear pattern and may very well ... and yet again ... pay off, precisely as he intended it to.